The Kuga was beginning to look like a bit of an old-stager compared to flashier models like the Seat Ateca and Nissan Qashqai. No doubt, Ford is hoping a bold new look, more efficient engines and the latest tech will see the old boy back on top form. In terms of driving pleasure, the ST-Line chassis enhancement places the Kuga close, possibly even top, of the compact SUV class. While the fresh styling has sharpened its looks outside, the change to the latest SYNC3 operating system is a huge positive inside. However, the 1.5-litre Ecoboost petrol engine is no great shakes and is unnecessarily hampered by four-wheel-drive and a rather clumsy automatic gearbox, so you’ll be better off with the front wheel drive diesel version. 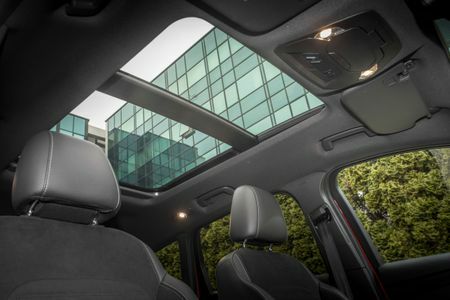 Our biggest concerns are reserved for the Kuga’s interior, though. There have been some material upgrades, but too many cheap plastics remain, and along with a lack of design flair, the cabin now feels massively outclassed by too many similarly priced rivals. 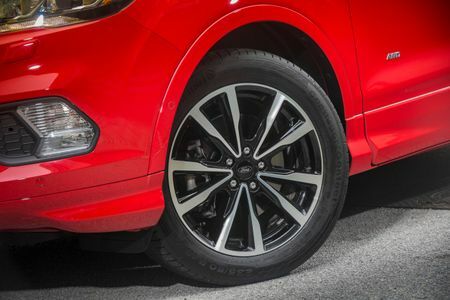 It’s fair to say that Ford has been a bit sluggish in responding to the explosion in SUV sales, but it finally seems to be getting its act together. 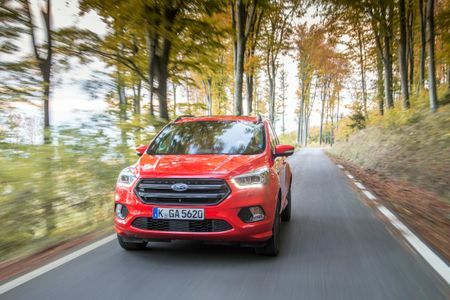 In recent months, we’ve seen the dinky Eco Sport and the grandiose Edge pulled in from diverse regions of the Ford empire in an effort to bolster its UK SUV portfolio. 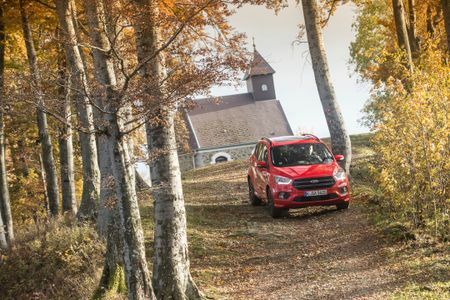 Of course, the Kuga is built in Europe and has been on sale here for donkey’s years, but it has been largely overshadowed in recent times by a plethora of shiny new offerings. Now though, there’s an all new one. Well, it’s more of a top and tail job, with a new nose, a revised tailgate and some flash lighting, all aimed at adding a dash of panache, as well as bringing the Kuga’s looks in line with its larger Edge brethren. 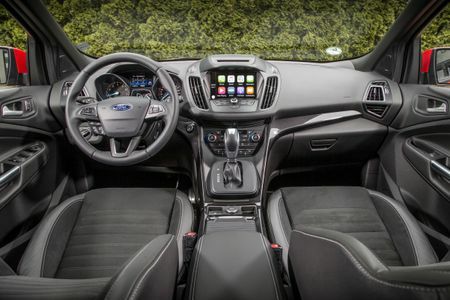 To be fair, the Kuga didn’t really need that much fettling in terms of its basic architecture, as its overall dimensions and interior space are generally on par with the class norm. It was in need of some cleaner engines and some updated tech, however. 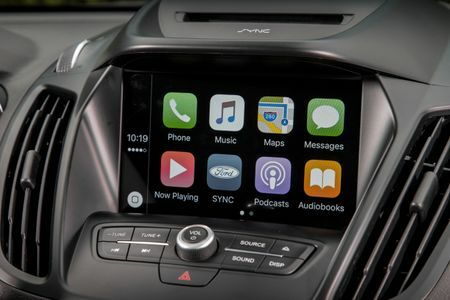 To this end, Ford has added its latest SYNC3 system, which features quicker responses for both voice and touch commands, alongside more intuitive menus featuring sharper graphics, as-well-as Apple CarPlay and Android Auto integration. There’s also a new trim line-up, including the all-singing all-dancing Vignale, featuring loads of leather and fancy seats, and ST-Line, with subtle body kit, a 10mm drop in ride height and uprated dampers, making it the sportiest option in the line-up. New engines include a pair of 1.5-litre turbocharged 4-cylinder lumps – one diesel and one petrol, and our initial drive saw us take a spin in the unleaded version. 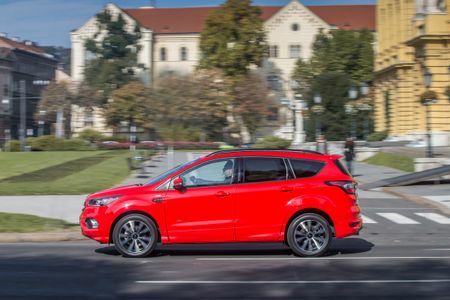 Hopefully, the latest Kuga is a sign that Ford is back to its best: building motors that drive and respond in an intuitive and effortless fashion. The Kuga is first and foremost a family car, so we don’t expect it to be flung around with unbridled abandon. However, there’s no doubting that if a car handles, responds and engages with the driver, then it is all the safer for it. 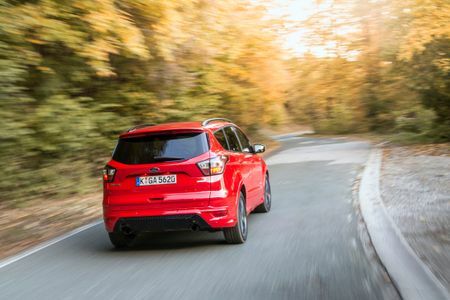 In this respect, the Kuga ST-Line is right up there with the best. For a start, the steering is tightly connected, delivering excellent feel and exhibiting a natural flow, both on turn in and return to centre. Ally this precision to sweetly-judged suspension that provides an excellent blend of comfort and control, then throw in loads of grip, and you end up with a car that is light and easy to drive in town, yet flows along twisting country roads with an ease that would put many a sports car to shame. Praising the 1.5 Ecoboost engine is not quite so simple, however. Linked to a standard six-speed automatic gearbox and a weight inducing, power sapping four-wheel drive system, despite its respectable on paper power output, it never feels like it’s about to win any traffic light sprint races. It’s not an entirely bad engine, but it does need a pretty stiff kick to get it motivated. Once the revs climb it introduces plenty of boomy resonances into the cabin. The automatic gearbox is not the sharpest: it manages to produce plenty of bumps as it shifts, and yet it’s also prone to slurring its lines, so it feels like the engine revs are speeding up but not much else is happening. 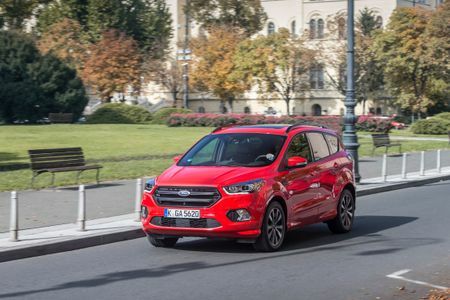 Up front, there’s about as much space on offer as a family hatchback – hardly surprising, given the Kuga’s close links with the Focus – and there’s also a reasonable amount of head-, leg- and elbow-room in the rear. 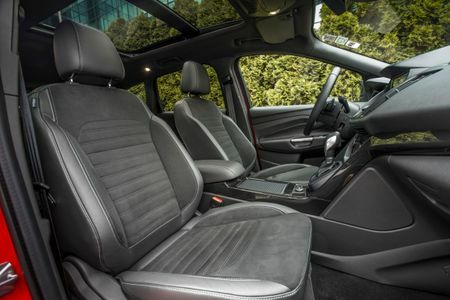 Although the rear bench doesn’t slide back and forth like in the Volkswagen Tiguan, you do at least get a reclining back rest to help ease your passengers’ neck muscles if they should fancy a bit of shut-eye. Sadly, although Ford reckons it has added some plusher materials, too many hard plastics remain and the overall design is looking pretty jaded. In too many areas, it lacks the quality of Volkswagen group products and is simply light years behind the design flair found in the latest Peugeot 3008. As for the boot, it’s a decent size – although you might have to fiddle around to fit a baby buggy – and there's a flat floor along with a flush loading lip, so at least it’s easy to slide things in and out. There’s also the option of a powered tailgate, which will no doubt come in handy if you regularly struggle with arms full of shopping and fractious toddlers. 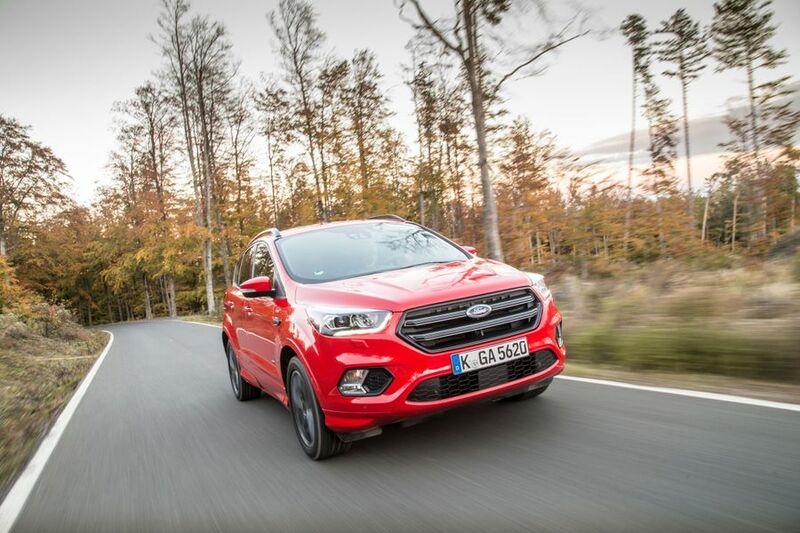 Given that we’re not fans of this particular Kuga, we’d probably give it a wide berth, but that’s not to say we would dismiss the Kuga out-of-hand. The ST-Line’s wonderful chassis, married to a front-wheel-drive diesel engine would no doubt solve the vast majority of the shortfalls we’ve highlighted. Plus, you’d save a shed load of cash. Clearly, a change of motivation won’t address the shortcomings of the ageing cabin, but there is still much to admire about the Kuga. It’s a robust, comfortable and very usable nuclear family car. What’s more, if you occasionally like to shake off the shackles of family life, it’s also a surprisingly exhilarating driver’s car. Great looks and agile handling, allied to solid practicality and proven Volkswagen mechanicals should move the Ateca straight to the top of your shortlist. A truly brilliant car in almost every respect; the Qashqai offers a stunning mix of style, quality, practicality, refinement, comfort, efficiency and affordability. The Sportage is Kia’s best-selling car and for good reason. It’s decent to drive, practical, generously equipped and high in quality. Overall, it’s a very impressive family car. Interested in buying a Ford Kuga?